My friend Roger Zanarini had been after me for a few years to join him in Omaha for the College World Series, so last weekend we finally made the trip to see four games and all eight teams in two days. I'm glad I did. Zanarini isn't exactly a stranger in Omaha. In the past 41 years, the only CWS he's missed was last year when his home in Dakota Dunes, South Dakota - about 100 miles north of Omaha - took on 39 inches of water thanks to the swollen Missouri River. Okay, it's a flimsy excuse for missing out on the big four-oh, but I can forgive him. He's the same guy who's played golf in all 50 states, so streaks and records obviously carry some weight with Roger. Play continues in Omaha all this week as the national champion will be crowned next Monday or Tuesday. 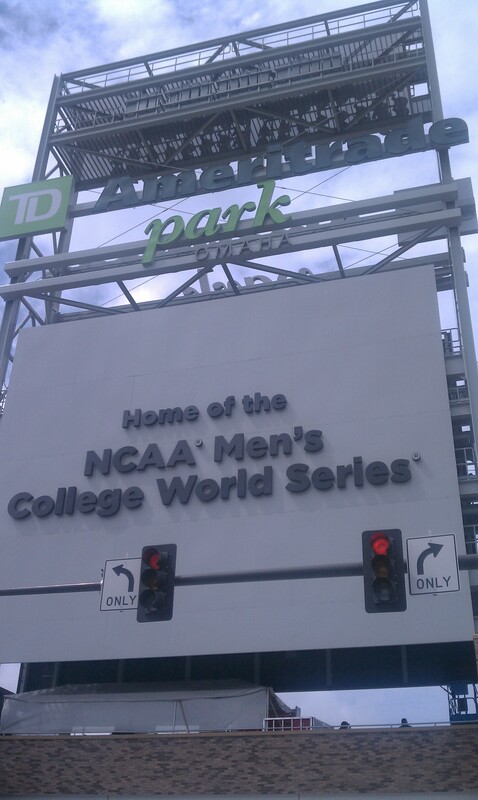 Omaha has been host to the collegians since 1950, and the city's new jewel is TD Ameritrade Park The Trade, if you will - which opened for the 2011 Series at a cost of $140 million. The place is impressive. It seats 24,000 and basically all 16 or 17 games are a sellout. Attendance last year was more than 360,000, and The Trade was packed last weekend with legions of college kids but also people like ourselves who simply enjoy baseball. The previous site, Rosenblatt Stadium built in 1947, sits about two miles south, awaiting demolition to create additional parking for the adjacent Omaha Zoo. We drove over to view the old lady and found the depressing tableau of a ballpark surrounded by fencing with "No Trespassing" signs, awaiting its fate. According to Inside Pitch magazine, the city poured more than $7 million into improvements for Rosenblatt over the last 10 years. The Omaha Storm Chasers, the Royals' Triple-A farm team, used to call Rosenblatt home, but they too opened a new ballpark in 2011, 9,000-seat Werner Park about 17 miles southwest of downtown. Apparently money isn't a problem when it comes to ballparks in Omaha. Going back downtown, a party atmosphere prevails as you walk through the streets and parking lots surrounding The Trade. This is an NCAA event, so there are no beer sales inside the park. However, the flood at Zanarini's house pales in comparison to the barrels of beer consumed by the college kids and others at the bars and restaurants adjacent to the ballpark. If you can't get buzzed at the ballgame, just walk across the street. The sculpture The Road to Omaha was brought over from Rosenblatt and now resides on the street corner behind the home plate entrance to The Trade. 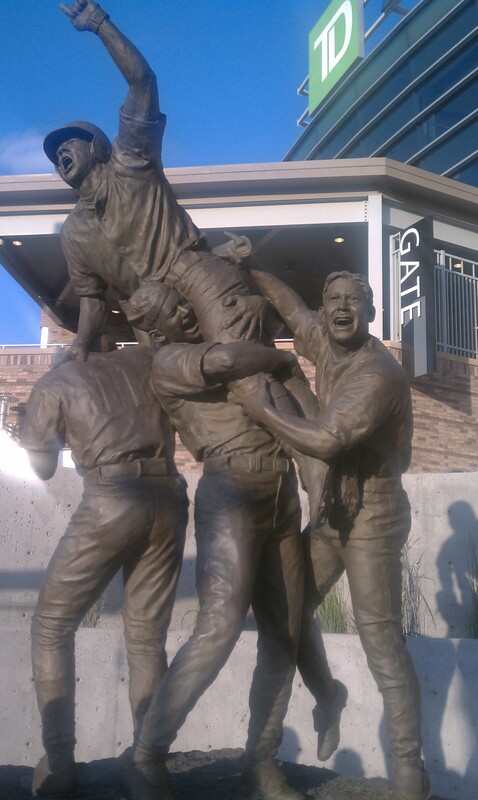 I've seen many memorable monuments to baseball, but this one ranks near the top. Inside we found mascots, up to 30 or 40 beach balls being batted around the outfield bleachers, pig sooey cheers for the Arkansas Razorbacks, enough waves to make you puke, and other collegiate behavior which clearly sets this event apart from any baseball I've witnessed. I expected to see a slew of major league teams represented with scouts seated behind home plate, but I found just a few. Since the draft had been held only 10 days earlier, many of the players already had been selected. Nevertheless, Butch Baccala from the Mariners had his notebook, stopwatch, and speed gun handy as he surveyed the scene. Seattle had selected Florida catcher Michael Zunino, the collegiate player of the year, with the third overall choice, and the Gators were part of the eight-team field. "I'm here basically to watch Michael and also to see some of the players who will be eligible for next year's draft," said Baccala, who primarily covers the West Coast, prior to watching Zunino and his teammates fall 7-3 to defending champion South Carolina. Baccala has been a scout for Seattle, Cincinnati, and Atlanta for 23 years after a brief two-year career as a pitcher in the Phillies organization. He first saw Zunino when he was "11- or 12-years old," and he's enthused about the kid's prospects. "He's a solid, solid baseball player that has the skills offensively and defensively," Baccala said. "He has a chance to hit home runs, he's a plus defender and has great intangibles. He's a leader, a solid character guy, the type of guy you want to add to your organization, especially when you're a last-place team like we are. You're trying to get players who are good and who have the make-up. He fits all those. Michael has proven himself for years that he stands at the top, and now he's going to get a chance to prove his worthiness on a major league field." South Carolina wasn't much interested in letting Zunino beat them, twice walking him intentionally. The Cape Coral, Florida, native struck out in the first inning but later drove in a run with a sacrifice fly. I asked Baccala if he was familiar with White Sox first-round pick Courtney Hawkins, the high school outfielder from Corpus Christi, Texas. "That's a good draft," he said. "The Hawkins kid is an absolute beast. The White Sox have done a good job of getting big, physical guys, and he fits right into the mold of players they've signed." I was curious whether Baccala had seen Moneyball - especially the scene where Billy Beane (Brad Pitt) winds up firing one of his scouts after a heated discussion about how to evaluate baseball talent. The scout, Grady Fuson, comes across as old school and at odds with Beane's sabermetric philosophy. Baccala had seen the film. "I think a lot of that was inaccurate," he said. "I know Grady Fuson very well. Grady is a stand-up guy and he's a scout's guy. All I would say about the whole Moneyball issue is after two years of doing it that way, Oakland went back to drafting high school players." 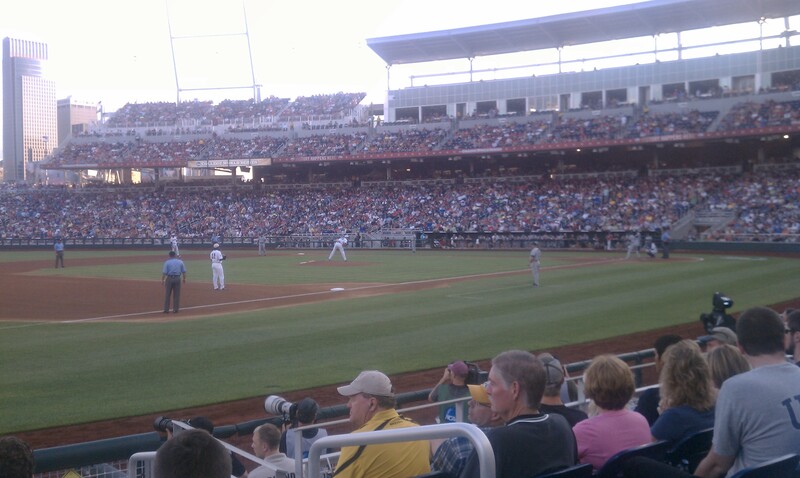 Heading back to my seat along the third-base line, I was impressed by a number of aspects of college ball. Fundamentally, these kids are well-schooled. For instance, in four games, I saw 12 successful sacrifice bunts. A couple of others were thwarted by defensive gems. These kids were able to deaden the ball and lay down successful bunts as good or better than big leaguers despite using these BBCOR bats, hyped as performing like wood. They sure don't sound like it. Later Saturday night, I watched Alejandro De Aza, obviously using wood, put down a splendid sacrifice bunt in the ninth inning of the Sox 5-4 win over the Dodgers. De Aza is one of the few Sox - Alexi Ramirez and Eduardo Escobar are others - who can bunt successfully. In Omaha it seemed like everyone was a threat to lay one down. Tonight the Cubs and Sox begin another three-game set, this time on the South Side. Zach Stewart will make the start for our guys. He pitched for Texas Tech. Matt Garza goes for the Cubs. His school was Cal State-Fresno. And now here they are.